The last transit of Venus happened in 2004, as captured in this satellite image. Astronomers around the world will take advantage of Tuesday's historic Venus transit to get better at finding and characterizing alien planets. Venus will cross the sun's face from Earth's perspective on Tuesday (June 5; Wednesday in much of the Eastern Hemisphere), marking the last such Venus transit until 2117. Scientists once chased planetary transits in an attempt to size up the solar system, but this transit of Venus will be put to different use. "Astronomers in the 18th and 19th centuries observed transits of Mercury and Venus to help measure the distance from Earth to the sun," Frank Hill, director of the National Solar Observatory’s (NSO) Integrated Synoptic Program, said in a statement. "We have that number nailed down now, but transits are still useful. This one will help us calibrate in several different instruments, and hunt for extrasolar planets with atmospheres." In addition to being rare and impressive skywatching events, Venus transits have played a large role in astronomical history. For example, scientists mounted huge expeditions to view the 18th century's two transits, which occurred in 1761 and 1769. Famed British explorer Captain James Cook took part in the 1769 observations, watching the transit from Tahiti. Both of the 18th-century efforts failed, but astronomers eventually got the data they needed from photographs taken during the next pair of Venus transits, which occurred in 1874 and 1882. Astronomers will use Tuesday's transit to help calibrate their instruments and study Venus' atmosphere, which could help them hunt down and characterize alien planets. NSO scientists, for example, will observe the transit using telescopes in Arizona, New Mexico, California, Hawaii, Australia and India. They'll make many different measurements of Venus' thick, carbon-dioxide-rich atmosphere. Because the composition of Venus' air is relatively well known, such observations should provide a benchmark for studying details of exoplanet atmospheres during transits, researchers said. Astronomers already key in on transits to search for alien worlds, often finding them by detecting the telltale dips in brightness exoplanets cause when they pass in front of their parent stars. NASA's Kepler space telescope has been very successful using this technique, flagging more than 2,300 candidate alien planets to date. A small fraction of these candidates have been confirmed so far, but Kepler scientists estimate that the vast majority — at least 80 percent — will end up being the real deal. As Venus makes the nearly seven-hour trek across the sun's face on June 5, the planet will be watched by many other instruments around the world — and some off of it. 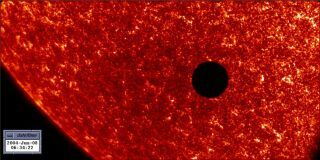 NASA's Solar Dynamics Observatory spacecraft, for example, will have a great view of the transit from Earth orbit. Another spacecraft, the European Space Agency's Venus Express probe, won't be able to see the transit as it zips around Earth's hellishly hot "sister planet." But the Venus orbiter will still make useful measurements during the event, researchers said. “During the transit, Venus Express will make important observations of Venus’ atmosphere that will be compared with ground-based telescopes to help exoplanet hunters test their techniques," said Håkan Svedhem, ESA’s Venus Express project scientist. Editor's Note: If you take any great photos of the Venus transit and would like them to be considered for use in a story or image gallery, send them to SPACE.com Managing Editor Tariq Malik at tmalik@space.com.